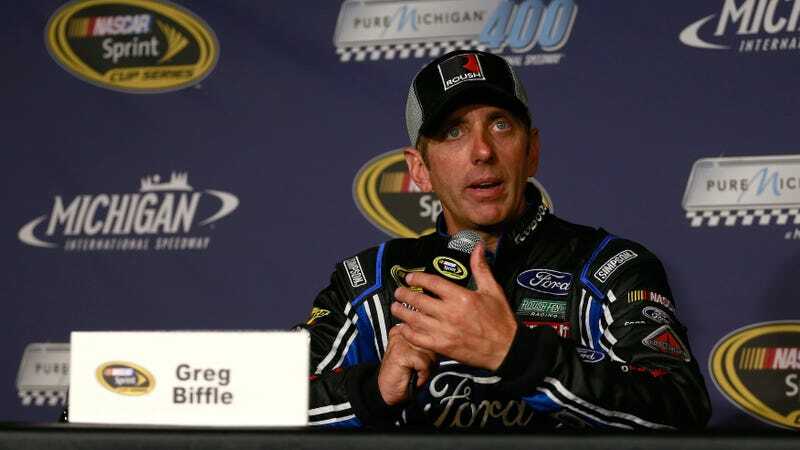 Greg Biffle during a NASCAR press conference in 2016. More than a year after former NASCAR driver Greg Biffle’s ex-wife and former mother-in-law filed a lawsuit against him alleging that he ran secret cameras in their bedrooms and master bathroom, a North Carolina jury found him guilty of invasion of privacy on Monday. The jury ordered that Biffle pay them $1. The Charlotte Observer reports that Nicole Biffle’s lawyer, Amy Simpson, said Monday night that the jury awarded her $1 after finding Greg Biffle guilty of recording her in the bedroom and bathroom for two years, and that the jury found it to be “an unlawful invasion of privacy.” The trial went on for nearly two weeks in Mecklenburg County Civil Court, in which WSOC-TV reports that Greg Biffle denied on the stand doing anything inappropriate. Nicole Biffle and her mother, Sara Lunders, filed a lawsuit against Greg Biffle over the cameras in June of last year, a little over two years after Nicole Biffle and Greg Biffle legally separated. They’d been married since 2007, according to the lawsuit. Nicole Biffle and her mother sued Greg Biffle, his colleague Ricky Matthew Reavis and his former NASCAR race team, Roush Fenway Racing. The lawsuit claimed that in 2013, Reavis, an employee of Roush at the time, installed the cameras in the home Greg Biffle moved out of when he and Nicole Biffle separated in 2015, and that Reavis helped him activate the ones in the master and guest bedrooms. The allegations then said Greg Biffle had the cameras connected to a DVR recording system in his gun safe, and that both Reavis and Greg Biffle had access to 24/7 feeds through an app on their phones. The lawsuit also accused Greg Biffle of showing the footage to others. That’s where the race team came in. The lawsuit said Reavis’ phone was owned by Roush Fenway Racing, and that he admitted under oath to having unlimited access to footage and to backing the files up on a Roush server in case the files got written over by the DVR. The lawsuit said it was believed that Roush knew or should have known what Reavis and Greg Biffle were using its resources for. Greg Biffle said before the trial that the cameras were there because he thought the people cleaning his house were stealing from him, and WSOC-TV reported after the trial that he said Nicole Biffle knew the cameras were there. Nicole Biffle says in the lawsuit that she “has suffered loss of appetite, loss of sleep, pain in her abdomen, emotional distress, worry, humiliation, fear ... and other anxiety-related conditions” as a result of the alleged secret filming.